It can be tricky to keep up on car seat laws when traveling through large regions. Each state has its specific regulations, and while many are similar, a few differ. Some states are more detailed than others, and while there are no federal blanket laws for car seat use, you can follow what are considered best practices for child safety in vehicles. Generally, from birth until at least age 2 (or until they outgrow the rear-facing position) infants and toddlers should be in an approved car seat, face backward, and be in the rear seat. Unless absolutely necessary, children this young should not be placed in the front passenger seat. From 2 to 3 years until about 4 or 5 years old, kids can then be turned the forward-facing position. They should still be in the back seat, and the car seats should meet guidelines for their height and weight and be properly installed. If kids must ride in a front seat, the passenger-side airbag must be disabled. Most states dictate that a child to be at least 40 pounds and 57 inches tall (or 4 feet 9 inches) before moving from a car seat to a booster seat or regular seat belt—although there are some exceptions. Check with each state to be sure. In Alabama, kids between the ages of 6 and 15 must wear a seatbelt regardless of where they sit. Booster seats and car seats are required until children are 6 years. Kids in Alabama also must sit in forward-facing seats or convertible child seats until they are either 5 years or 40 pounds. In Alaska, kids between the ages of 8 and 16 who are less than 57 inches tall and under 65 pounds must be restrained in a child safety seat or seatbelt determined by the driver of the vehicle. Kids over the age of 4 or taller than 57 inches and weighing greater than 65 pounds must be restrained with a seatbelt. Kids in Alaska between 4 and 8 years old who are less than 57 inches tall and weigh between 20 and 65 pounds must be in a booster safety seat or child safety seat. Infants who are younger than 1 year or weigh less than 20 pounds must be secured in the rear facing position in an infant car seat. Children in Arizona who are under 16 years old are required by law to be restrained in seatbelts. Children between 5 and 8 years and 57 inches tall or less must use a booster seat. Kids in Arizona must also be secured in with child restraints under the age of five. In California, children under 8 years or 57 inches must be in a proper child restraint system. Children between 8 and 16 years or over 57 inches must be buckled with a seatbelt. Kids under the age of two in California, and under 40 pounds or 40 inches, are required to be in a rear-facing child seat. California is a bit specific about their laws and how properly children are restrained. The lap belt must be low on kids hips and touching their upper thighs, and children’s shoulder belt must be across the center of their chest. Kids in Colorado must wear seatbelts between the ages of 8 and 16. Under the age of 8, children must use a forward facing car seat or booster seat. Children in Colorado under the age of 4 or less than 40 pounds need to be restrained in a car seat. Infants in Colorado younger than 1 year or 20 pounds must use a rear-facing car seat. In Connecticut, children over seven years old who weigh more than 60 pounds must be in a standard seat belt. Kids in Connecticut younger than 8 years or less than 60 pounds have to use a child car seat. When children are under 4 years or 40 pounds, they need a harness restraint system. While youngsters under 2 years or 30 pounds are required by law in Connecticut to be in a rear-facing child car seat. The laws in Delaware state that no children who are 65 inches or shorter or who are under the age of 12 can ride and a front passenger seat with an airbag unless the airbag has been deliberately disabled. Kids in Delaware under 8 years or 66 pounds and under have to be secured in a child car seat or booster seat. In the district of Columbia or Washington DC, kids are required to be in either a child restraint or a seatbelt between the ages of 8 and 16. Children in Washington DC under 8 years must be in a child safety seat. In the sunshine state of Florida, kids between 6 and 18 years old have to be in a child restraint or a standard seatbelt. Children in Florida under 6 must use an approved child car seat. In Georgia, kids between 8 and 18 years and over 4 feet 9 inches must be in a seatbelt regardless of the seat in a vehicle. Kids in Georgia under the age of 8 and shorter than 4 feet 9 inches are required to be in a car seat, and if available, in the rear seat. In the islands of Hawaii, kids between the ages of 8 years old and 17 must wear a seatbelt. Children in Hawaii between 4 and 8 years old are required to ride in a child safety seat or a booster seat until they are over 4 feet 9 inches or if they weigh more than 40 pounds. Kids in Hawaii over 40 pounds can be belted with a seat belt without a booster if they are in the rear seats of a vehicle with a lap belt only. Idaho has fewer stipulations then some states when it comes to child safety seats. In Idaho, children below the age of 7 are required to sit in a child safety restraint or an approved car seat. Kids in Illinois under the age of 8 years old must be secured in a child restraint system or car seat. Kids in Illinois over 40 pounds can ride in the backseat with only a lap belt, so long as the backseat is not equipped with a lap and shoulder belt. Children in Indiana between the ages of 8 years old and 16 must be in a seat belt or a car seat. Kids in Indiana under the age of 8 years old are required to be restrained in a child restraint system by the manufactures instructions. When children are over 40 pounds, they are allowed to ride in the backseat of the vehicle with just the lap belt (no shoulder belt). Child vehicle restraints in Iowa are straightforward. Kids in Iowa between 6 years old and 18 are required to wear a seatbelt or a child restraint system. While infants in Iowa under 1 year of age or 20 pounds must ride rear-facing in an infant car seat. Kansas kids between 8 and 18 years old, and over 80 pounds or taller than 5 feet 9 inches must wear a standard seatbelt. 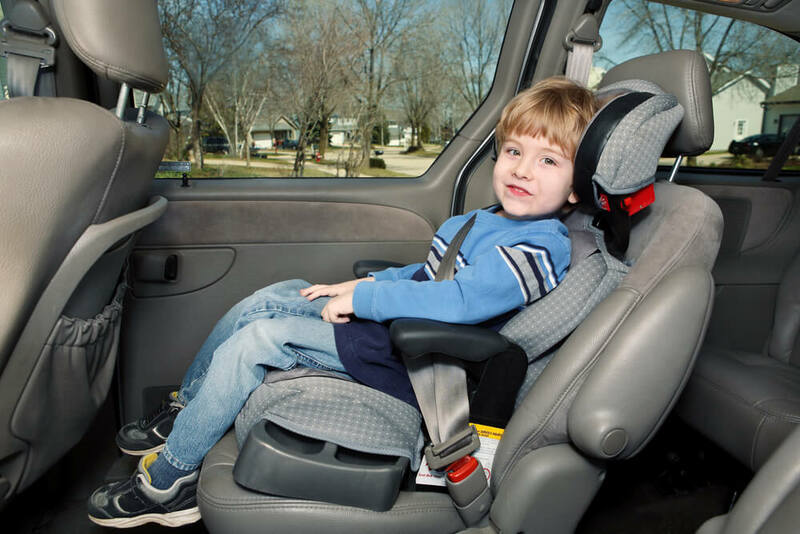 Kids in Kansas under 4 years or who weigh less than 80 pounds or are shorter than 57 inches must be restrained and either a child passenger safety system or a child booster seat. Children in Kansas under 4 are required to be in a car seat. Kids in Kentucky under 8 years old or between 40 and 57 inches tall are required to be secured with a booster seat. Children who are 40 inches or shorter in Kentucky must be fastened in a child car seat. In Louisiana, kids between the ages of 6 and 13 or those who are more than 60 pounds are required to use either a booster seat or seatbelt regardless of their seating position in the vehicle. Children in Louisiana between 4 and 5 or weighing 40 to 60 pounds are required to use a booster seat when buckled. Kids between 1 and 4 years old or 20 to 40 pounds must be in a forward-facing child car seat. Infants under 1 year or weighing less than 20 pounds in Louisiana must be in a rear-facing car seat. Up in Maine, kids between 8 and 18 years old or more than 57 inches in height are required to be secured in a seatbelt. Children in Maine under the age of 12 or under 100 pounds must be in the rear seat if available. Children in Maine weighing between 40 and 80 pounds who are under the age of 18 must be in a booster or a child safety seat. Kids under 40 pounds must ride secured in a car seat that meets federal standards. Children in Maryland under the age of 16 must be in either a seatbelt or child safety seat. All kids in Maryland under the age of 8 are required to ride secured in a child car seat unless they are 57 inches or taller in height. In Massachusetts, kids between 8 and 12 years old must use the proper car seat or safety belt fastened to their height. Children in Massachusetts under the 8 and shorter than 57 inches must ride in a child restraint car seat. In the third coast, kids under the age of 16 are required to wear a proper seatbelt or be in an approved car seat regardless of their position in the vehicle. Children in Michigan under 8 and less than 57 inches are required to be secured in either a booster seat or child car seat. Kids under the age of 4 in Michigan must be fastened in a child restraint system in the rear row. Up in Minnesota, kids under the age of 7 and shorter than 57 inches are required to be in a child restraint. In Mississippi, children between ages 4 and 6 who are less than 57 inches tall and weigh less than 65 pounds must be securely fastened with a booster seat. Children in Mississippi below the age of 4 must be secured in the appropriate child passenger restraint system for their size. Kids in Missouri between the ages of 8 and 16 weighing at least 80 pounds, or who are taller than 57 inches are required to use the seatbelt or appropriate child booster seat when necessary. Children in Missouri between ages 4 and 8 have to ride in a booster seat or proper child restraint system. Missouri kids less than 4 years or less than 40 pounds must be in a car seat. Children in Montana under the age of 6 and weighing less than 60 pounds have to be restrained in a proper car seat appropriate for the child’s height and weight according to manufacturer standards. In Nebraska, children between the ages of 6 and 18 are required by law to ride fastened with a seatbelt regardless of their seat. Kids in Nebraska younger than the age of 6 must be secured in a proper car seat. Nevada is another state that is slightly undetailed with car seat laws. However, kids in Nevada under 6 years old and who weigh less than 60 pounds are required to be fastened in a child car seat. In New Hampshire, any passenger under 18 must wear a seatbelt. Kids in New Hampshire under the age of 7 and shorter than 57 inches must be fastened in a child restraint system. In the Garden State, kids under the age of 8 weighing less than 80 pounds must be in a booster or car seat. If possible, these kids must also ride in the rear seat. Children in New Jersey under 2 years and who weigh less than 30 pounds must be in a rear-facing car seat. Kids under 4 weighing less than 40 pounds must be in a rear row but forward-facing position. While children in New Jersey under 8 years and 57 inches tall are required to be either in a forward-facing car seat or booster seat in the back. Children in New Mexico under the age of 18 must be belted in a seatbelt or a child restraint system. Kids in New Mexico between the ages of 5 and 6 or less than 60 pounds must sit in either a booster or child safety seat. It’s mandatory for children between the ages of 1 and 4 years weighing less than 40 pounds to be in a child passenger restraint system. While infants under 1 year must be in the rear-facing child seat and in the rear row if possible. In the great state of New York, all kids between the ages of 8 and 16 are legally required to wear a seatbelt in any seat of a vehicle. All children in New York between 4 and 8 years or under the age of 4 but over 40 pounds, must be fastened with a booster seat. Infants and kids in New York under 4 and less than 40 pounds are required to be in a child restraint system. In North Carolina, kids between the ages of 8 and 16 must be fastened in a child seat or with a seatbelt. Children in North Carolina under 8 years or weighing less than 80 pounds must be in a child seat. If the car has a passenger-side airbag enabled and also has a rear seat, youngsters in North Carolina must be secured in the back row. Up in North Dakota, kids between the ages of 8 and 18 are required to be in a size-appropriate car seat or fastened with a safety belt. Children in North Dakota under 8 years and shorter than 57 inches tall must ride in a child restraint system. In the Buckeye State, kids between the ages of 8 and 15 must wear a seatbelt or be in a child restraint. Children in Ohio between 4 and 8 years and shorter than 57 inches must be buckled in with a booster. Kids younger than 4 who weigh less than 40 pounds must be in a child restraint seat. Children in Oklahoma who are at least 8 years and over 57 inches tall are required to wear a seatbelt regardless of the seat in the car. Oklahoma kids between 4 and 8 years under 57 inches must be in a proper child car seat or booster seat. Kids younger than 4 years must be in a child restraint system. The car seat must be rear facing until children are 2 years or reach the height or weight regulations for their specific car seat. Children in Oregon under 8 years old and weighing more than 40 pounds or who are 57 inches or shorter are required to ride in a car seat or a booster seat. The lap and shoulder belt must fit them properly. Kids in Oregon under 2 years also are required to be in a rear-facing child restraint system. Children in Pennsylvania between 8 and 18 years must be fastened in a safety belt regardless of their vehicle seat. Kids between 4 and 8 must be secured in and using a booster seat. While children in Pennsylvania under 4 are required to ride in a child passenger system. In the small state of Rhode Island, children between 8 and 18 years, or less than 8 who are more than 57 inches, or weighing more than 80 pounds are required to wear a seatbelt. All kids in Rhode Island under the age of 8 must be in the rear seat of the vehicle. Kids under 8 years or shorter than 57 inches must be in the back row in a child restraint system. Rhode Island kids younger than 2 years old or under 30 pounds must be rear facing. Children in the Palmetto State older than 8 years or 57 inches or taller must wear his seatbelt at all times. South Carolina kids between 4 and 8 years old who outgrow their forward-facing car seat must be fastened with a booster seat. Kids in South Carolina under the age of 2 must wear a harness child safety restraint even if they outgrow the rear-facing requirements. Under the age of 2, they must be rear-facing. Children in South Dakota under 18 are required to wear a seatbelt at all times. Children in South Dakota under 5 years or who weigh less than 40 pounds must be in an appropriately sized car seat. In Tennessee, kids between ages 9 and 16 must wear a seatbelt. Children in Tennessee under 9 years old are required to ride in the rear seat if possible. Those between 4 and 9 years old or shorter than 57 inches must use a booster. Tennessee children between 1 and 4 years old who weigh more than 20 pounds must be restrained in a child seat, while infants less than 1 year or under 20 pounds must be in a rear-facing car seat. In the Lone Star State, children between 18 and 17 or at least 57 inches tall must be fastened with a safety belt. Children in Texas under 8 years old and less than 57 inches tall must ride in a child passenger safety seat. Utah is a little less restrictive with their laws. In Utah, children under 8 years old must be in a car seat until they are of age according to the manufacturer’s guide or at least 57 inches tall. In the Green Mountain State, children between 8 and 18 are required to use a seatbelt. Kids in Vermont between 1 and 8 years who are over 20 pounds must be in a federally approved child restraint system. Those who are 1 year or less or who weigh less than 20 pounds must be restrained in an approved rear-facing infant seat. Virginia kids between 8 and 18 must be fastened in a booster seat or car seat dependant upon on their size. Those who are under 1 must be rear-facing in an infant seat. Out in the Pacific Northwest, all kids under 16 must wear appropriate seatbelts. The proper fitting child restraint system is required for all kids in Washington until 8 years old or until the child is at least 57 inches tall. Washington kids under 13 years old must be in a rear seat whenever it is reasonable in the vehicle. West Virginia children between 8 and 18 years old must use a safety belt at all times. Kids in West Virginia under 8 years old must be an appropriate child passenger safety system. While those under 8 years and at least 57 inches or taller may ride with a safety belt. Wisconsin children are required to ride in a rear-facing car seat until at least 20 pounds or 1 year of age. After that, kids in Wisconsin must ride in a forward-facing child safety system until they are 4 years old or weigh 40 pounds or more. After which, they can ride with a booster seat until 8 years old or weigh more than 80 pounds or are 57 inches or taller. Wyoming children under the age of 9 must be in a proper child safety restraint system. Wyoming kids are required to ride in the rear seat unless the vehicle only has a single row, in which case they can be secured in a child safety restraint system in the front. When riding through more than one state, it’s wise to check the car seat laws before traveling with infants and children. Use the best practices guidelines if rules are changing or you are unable to find current information while on the road. Check car seats for wear or cracks and be sure they are correctly installed. Passenger-side airbags should be disabled for kids under about 100 pounds. Remember, modeling seat belt use is crucial for kids, so buckle up to teach them safety first-hand for years to come.